A revolution is taking place within healthcare that will affect its design, deployment and delivery. This revolution's agitators are those who have most to gain, and most to lose, from the changes that are being affected: patients. As the physician-patient relationship evolves, the nature of the expectations empowered patients bring to their interactions with pharmaceutical industry presences is also transforming. Through its presentation of a series of contextual observations and a concluding series of expert view summaries, this webcast assesses the impact that participatory medicine is having upon the pharmaceutial industry's representation and reception within the social web, and asks how the industry may prepare itself to discover, learn, and help in new digital environments. 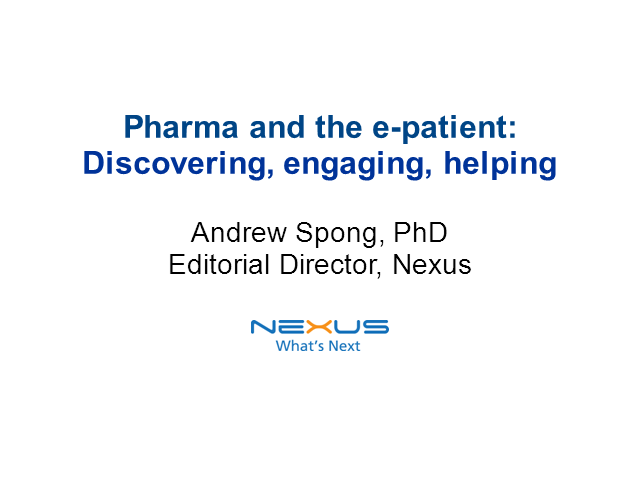 Andrew Spong, PhD worked for a decade in academia and a further 11 years in scholarly publishing before turning his attention to the health conversation on the social web. An industry thought leader, Andrew publishes regular comment and analysis at STweM.com, and is the co-founder of influential European Twitter-based community Healthcare Social Media Europe (#hcsmeu). Andrew assumed the position of Editorial Director, Nexus, part of the PSL group, in June 2010.